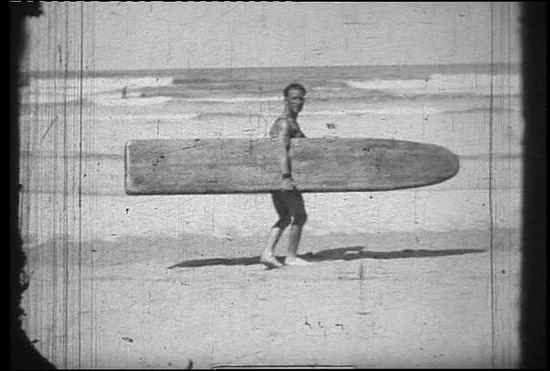 Is this Britain’s earliest stand up surfer? Eighty-one years ago Lewis Rosenberg and a group of friends saw a newsreel showing Australians surfing stading up on their surfboards – it was a moment of inspiration that changed their lives. This close-knit group of Jewish immigrants, who lived in London and Hove, had been riding their four-foot long wooden bodyboards in the West Country and Channel Islands for almost a decade. But in 1929 they set about building their own longboard, wrapped it in linen sheets, and took it on a steam train from London to Newquay. Not only did they try to teach themselves how to surf standing on their board, they also filmed their exploits and now this rare footage has been brought back to life after lying untouched in a Cambridgeshire loft for many years. It was then that the full beauty of the film became apparent, as this group of friends enjoyed a surfing life on deserted British beaches – sometimes riding the waves naked, and dancing the Hula wearing costumes made from seaweed. A small segment of the film appeared in a BBC4 documentary ‘Sea Fever’ in May (2010), and the North Devon based surf museum is releasing the full film and a book next year to coincide with one of its exhibitions ‘British Surf Riders: Surfing before WW2’. Sadly the group’s surfing fun was cut short by the Second World War, and the eight foot board which had been lovingly shaped from solid piece of wood was stolen from Lewis’s home in London – it’s unlikely the thief would have known it was a treasured surfboard. The film is the earliest film of anyone using a longboard in Britain – so far. And even though their attempts at stand-up surfing weren’t terribly successful it’s still a significant milestone in European surfing history. The Museum of British Surfing is a Registered Charity and is opening in Braunton near the North Devon coast in 2011. It has a large film & print archive and a collection of more than 160 British surfboards dating back a century – including a 1930s hollow wooden longboard found during a house clearance.